Be very Careful buying your new kitten from Catteries until you are comfortable with their husbandry and Vaccination protocal. Call around and be sincere and ask about other breeders experiences with the cattery you are interested in buying from. Ask about the initial contact and the sale process going forward. Ask about how the communications went and if they felt at ease and comfortable dealing with the breeder. Was there ever an issue that needed diplomatic handling. If so what was the outcome? Do they get thier kittens feline leukemia and internal parasite checked and offer that in a health certificate from a state qualified Vet. Many say they have a health certficate when it is just a visual from the vet and no testing is involved. A visual vet check health certificate is the minimal required by the airlines to get them on a plane to you and is no guarantee of health. These are just a few important points to ponder. Its just smart when paying what we do for a nice show baby. Would you really give someone several hundred dollars or more and NOT have them tested negative for these things from a qualified vet?? NEVER take someone's word on this. Have the tests done Prior to them leaving for your home. Run if the breeder strong arms you or insists their are other buyers waiting for them to call. Many do not offer a refund...only a replacement and then you never know if you will EVER get another replacement remotely close to the quality you originally purchased. Chances are you will not. In our beginning I had no knowledge of the Corona Virus that causes FIP .We had 4 girls and a boy and with blind luck had very healthy little cattery. I excitedly purchased a Top Show $2500.00 Male and lost him from a well established very decorated cattery in Early 2007. He was in quarantine in my office when he began symptoms 7 weeks after his purchase. $4000.00 in vet bills and 3 months later he died in my arms. A necropsy and copies of the vet visits proceeding his death were given to his breeder however he was not replaced as promised. Be Aware. We can all make nice pages showcasing our wins. It's how we deal with those who trust us that counts. Beautiful Vladimir should have been replaced with out strained communications. It was awful. 3 years later I was offered something much less and only after this was found by the breeder.....No Thanks! 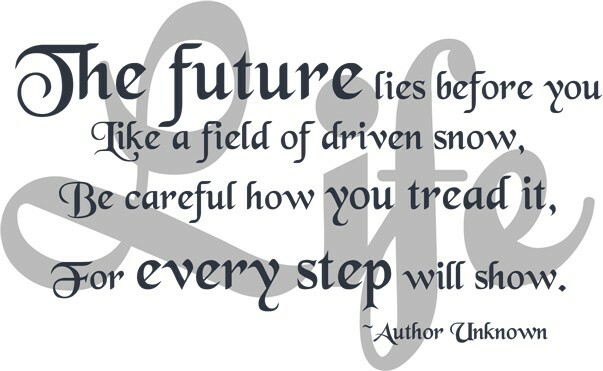 Lessons learned when we first started.... Many times you can be offered a gorgeous cat and find from references it is best to let it stay where it is as the breeder has a reputation for being difficult to deal with when a problem arises. You do not want that when you have a couple thousand dollars on the line with a show persian. Better yet Google the cattery name and call the others who have thier cats. Its surprising what you will find. Many treat this as a business as it is meant to pay their bills. NO CONTRACT...RUN...No medical testing run....Many Many unqualified people do this with ZERO knowledge of the breed or of its health suseptabilities...EVERY DAY we see Persians up for sale with the wrong color class attached to the advertising...#1 They do not know what it is they even have and 2. They lack the education or mentoring or finances needed to be able to make it. Its very expensive to do what we do and you have to have financial backing when the vet bills start rolling in...and they do. And please...if you see a Persian on a site that has a dirty face or is ungroomed...click off the site...that is unacceptable...Move on. We practice early seperation while immunities are at their peak as advised by Dr Addie to aid in prevention and transmission of these common viruses. There is no guarantee at this point however as there is no vaccine that prevents transmission. We do offer early seperation and testing for those who want a corona virus free kitten however we do ask a premium for this as it means round the clock feedings, IV fluids for those who are not weaning well , additional vet visits ect. Please just ask. When we have been tested by clients after raising their kitten separately we are successful in getting a negative titer. Due to a 50% loss rate we have altered our care policy to leave the kittens with mom a little longer as we were losing a great number of kittens unnecessarily. We pray for a vaccine to prevent this dreaded disease as it is a killer and not one that can be 100% prevented to date. 1. There is not a slight case of PKD, as so often heard in this hobby. 2. There is a DNA test easily accessible to all breeders via UC Davis that proves either the cat positive or negative. Its a 40.00 test and the cost of a stamp. Better to know before you buy than after you have fallen in love. My heart goes out to those who were not informed prior to their Adoption. An impressive pedigree is NO indication of the quality or condition of the kitten that you will be receiving!!! A closed unfriendly breeder of a few words is a great big flag no matter the number of Grands or DMS on the Pedigree. Do your Homework! Know what your breeds health susceptibilities are. Ask for references. Get to know your breeder first before you buy. Be specific in your questions and never buy without a contract so you have recourse. Be informed. Belcherpurrs I am Puppy, A fun little girl whom we placed as a forever pet in 2010. Located just outside Sunny Tampa Florida. 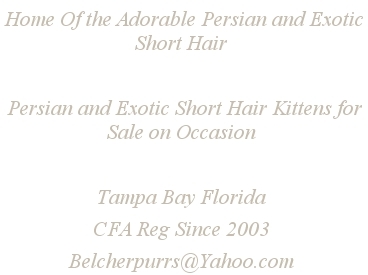 We began our research and education of the Persian breed in 2003. 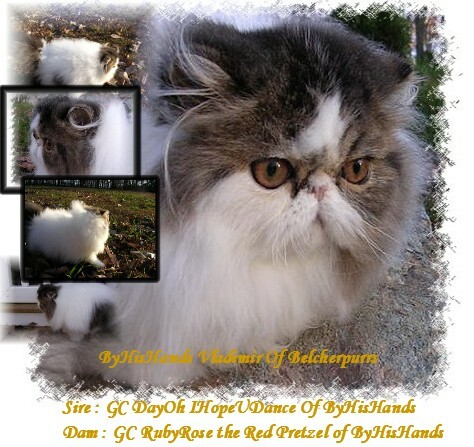 Today we are still learning so much and enjoy and Specialize in the Magnificent Bi Color Persians and Exotic short Hair. All of this takes a great amount of time and even more care. We are committed. 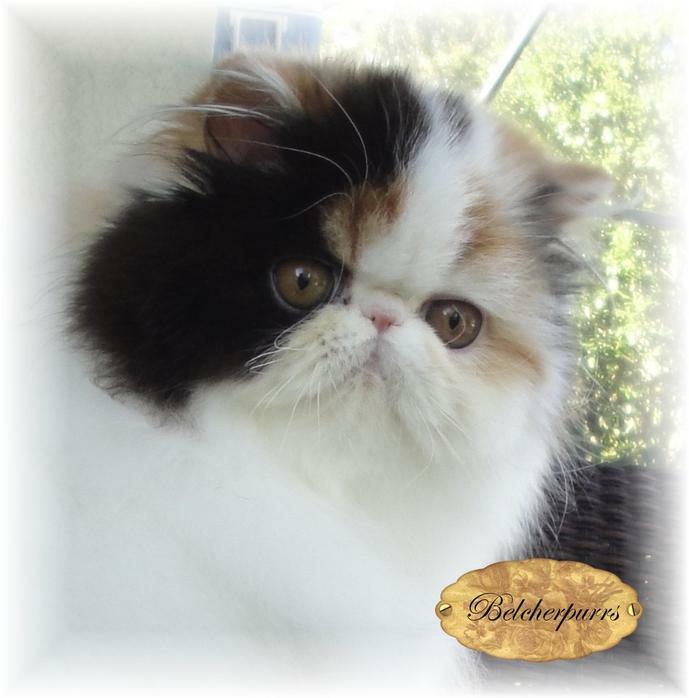 Presenting a Belcherpurrs baby is our joy and we look forward to sharing our work with those who trust our care. Take a peek at our Adorable Videos captured by us and our adoptive families on the AVAILABLE PAGE. Meet Cooper and Pancake as seen on Youtube, Cats 101 on the animal channel and the Ellen Degeneres Show. Thank You to everyone for thier care. It shows and we are very proud! My Precious boy Vladimir. While I had him only a short while he was my dream cat. There will never be another one like him.